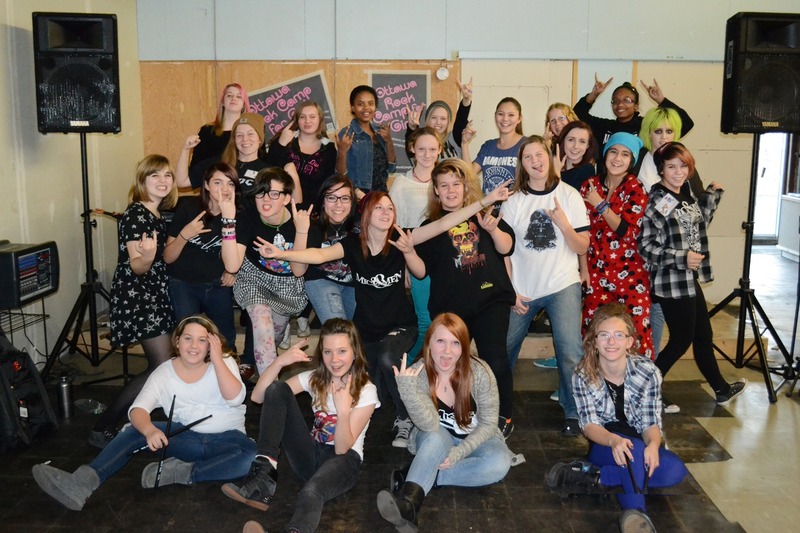 The JustChange Ottawa board is excited to announce that the latest $1,000 grant is going to Ottawa Rock Camp for Girls, an organization that uses music as a vehicle for empowerment for self-identifying girls. Their flagship event is a rock camp where participants learn an instrument, join a band, and showcase their achievements at a concert. They also host monthly jam sessions, where girls have access to studio space to practice their music. Tiffanie Tri, one of Rock Camp’s leaders, explains how their project seeks to empower girls through music. “We create a safe space for girls of all economic means and races so that they can build self-confidence. We are always looking for ways to reduce barriers to access to learning and playing music.” Their newest project aims to do just that. The Rock Camp for Girls team is passionate about their project, and they want to tell you all about. Come learn more and ‘jam’ with us at JustDrinks this Thursday, February 16 from 6 to 8 p.m. at Pressed Cafe, 750 Gladstone Ave.
Empower’em President and Founder, Nayaelah Siddiqui, understands there is a growing lack of self-confidence in Muslim women, which needs to be addressed. According to the Environics Survey of Muslims in Canada (2016), one of the top issues facing Canadian Muslims is how they are perceived by the larger, mainstream society. One-third (33%) of non-Muslim Canadians have a generally negative view of Islam. Moreover, Statistics Canada has noted that hate crimes against Canadian Muslims have doubled over the last three years. Muslim women, particularly those who are visibly Muslim due to the distinguished “hijab” or headscarf they wear, are the most frequent targets of hateful demonstrations that are manifested in numerous ways, including exclusion from mainstream society. 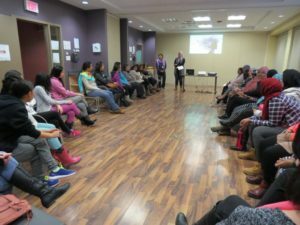 In the absence of strong support networks, these issues may lead to a lack of self-confidence, identity, and Canadian pride if they are left unaddressed; further discouraging young women from fully thriving in their communities and hindering their ability to contribute in positive ways to enrich Canadian society. This is why JustChange is proud to support Empowerem’s main objective of boosting self-confidence in women by empowering them in four key areas of development. These four objectives help with empowering young women better enabling them to become more informed, engaged and civically active so that they can become positive forces in their communities, in Ottawa, and by extension the wider Canadian society. For example, through Skills Development, Empower’em provides workshops on car management (like how to change a tire or boost a car). Another example via the Outreach objective, they aim to start “Quilt for them.” This initiative will not only involve young women learning skills (e.g., sewing), but also paved a way for them to have a positive impact in the communities they live in. Women can start projects that they are most passionate about with like-minded people which would lead to a stronger and more collective effort in community projects. You can learn more about Empower’em at their website here: http://empowerem.ca/ and join us for #JustDrinks on December 15th 2016 at 6:30pm at the Ministry of Coffee and Social Affairs at 1013 Wellington St W, Ottawa, ON K1Y 2Y1 to celebrate this incredible Ottawa-based initiative. You can reserve your free ticket here. 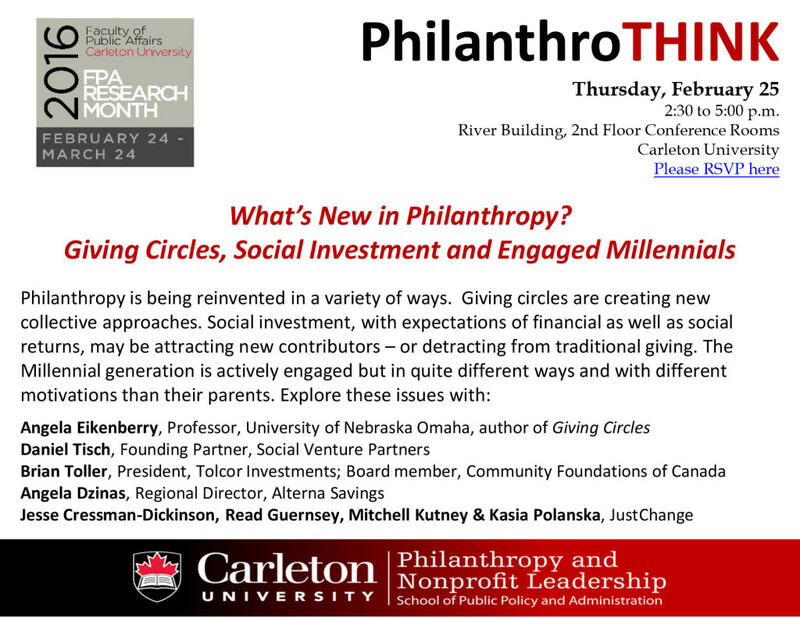 JustChange and PhilanthroTHINK: What’s New in Philanthropy? Free Event at Carleton University on February 25th 2016 at 2:00pm! The initiative will operate in a sustainable manner by using low carbon farming practices to provide a food source within the community. Brittania Backyard Edibles relies on residential sub-acre plots to turn backyards into productive food gardens that help provide more access to much-needed locally grown vegetables. This backyard urban farming model provides a gateway for new methods of food production that brings the farm into an urban landscape and closer to the market. JustChange Ottawa’s grant will contribute towards various start-up materials and equipment for the first season of Britannia Backyard Edibles, including a drip irrigation systems for the first five plots and season extension materials, such as row cover and galvanized metal hoops for creating low tunnels. On April 9th at 5:30pm-7:30pm, JustChange Ottawa will be celebrating #JustDrinks with Madeleine Maltby and her new initiative, Britannia Backyard Edibles at Bread By Us (accessible venue and extended hours of operation) at 1065 Wellington St. West. You can register for free here. Brittania Backyard Edibles can be reached on both Facebook and Twitter. 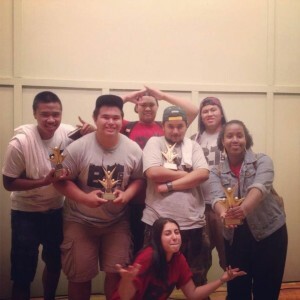 JustChange is happy to announce our tenth grant winner, YouthCanSlam, and invites you to check them out as they host their second annual festival in Ottawa August 12-16! The $1000.00 grant will go to support youth who are interested in poetry across Canada to connect with one another, develop as writers and performers, and promote youth poetry to the public. Led by a group of Ottawa-based spoken word poets, YouthCanSlam held its inaugural festival last summer for about 50 youth participants. YouthCanSlam strives to provide mentorship and professional development for youth poets, maintain a collaborative and supportive network of youth poets across Canada, and support youth poets as they enhance their skills and develop their voices. 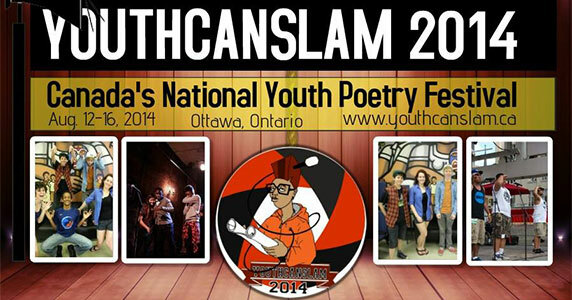 As Ikenna Oyegbula, YouthCanSlam’s Director, puts it, YouthCanSlam is “a statement of the empowerment of Canada’s youth that affirms the power of their voices and supports their participation in a major oral literature event at the national level catering to their experiences”. YouthCanSlam 2013 was a very empowering experience for me. I learned that my words had power and that my story was something that people wanted to hear. YouthCanSlam has been life changing, art changing, mind changing and heart changing. This year, YouthCanSlam is hoping to continue to build the youth poetry movement with its festival being held at the University of Ottawa August 12 to 16. Events include free poetry workshops and open mics, affordably priced showcases, and the National Youth Poetry Competition.The events not only allow youth poets to gather and connect; they also provide the broader Ottawa community with the opportunity to witness and support youth art and showcase our local youth poets. If you’d like to learn more about YouthCanSlam, or want to participate in this year’s festival, we encourage you to check them out at www.youthcanslam.ca. 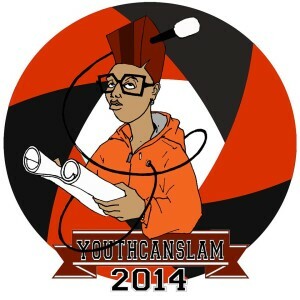 They can also be found on Twitter @youthcanslam, on Facebook at Youthcanslam Festival, and on YouTube at YouthCanSlam. Join us in recognizing YouthCanSlam at our next JustDrinks event on August 6th at Lowertown Brewery 5:30pm to 7:30pm. Let us know you’ll be there, get your FREE eventbrite ticket today.